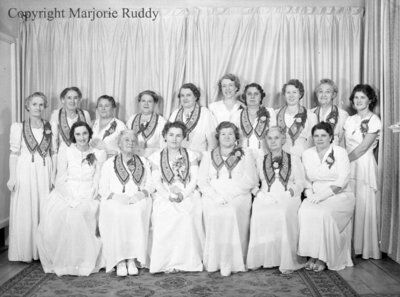 A black and white photograph of an installation team of the Benevolent Rebekah Lodge No. 132. Back row from left to right: Edith Hoar; Elizabeth Thompson; Lena Pellow; Nellie Wilson; ; Mae Hopper; Greta McDonough; Alma Dewey; Ruby Hewis; Ada Wickett; Isobel Saunders. Front Row: Hilda Hewis; Grace Dent; Lillian Correll; Lottie Plaskett; Tena Roberts; Donna Martin. Rebekah Lodge Installation Team, October 6, 1948, Marjorie Ruddy. Whitby Archives A2013_040_1620.